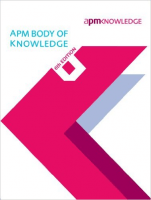 The APM Body of Knowledge is a key component of the APM Five Dimensions of Professionalism. It defines the areas required to manage any successful project and forms the basis of APM's qualifications, accreditation, research, and publications. Find out more about Accredited APM® Training.